O God, who taught the Martyr Saint Wenceslaus to place the heavenly Kingdom before an earthly one, grant through his prayers that, denying ourselves, we may hold fast to you with all our heart. Through our Lord Jesus Christ, your Son, who lives and reigns with you in the unity of the Holy Spirit, one God, for ever and ever. Grant us, we pray, Lord God, the same perseverance shown by your Martyrs Saint Lawrence Ruiz and his companions in serving you and their neighbor, since those persecuted for the sake of righteousness are blessed in your Kingdom. Through our Lord Jesus Christ, your Son, who lives and reigns with you in the unity of the Holy Spirit, one God, for ever and ever. St. Wenceslaus was Duke of Bohemia, who after many trials in governing and evangelizing his people, suffered martyrdom at the hands of his brother. In the 17th century (1633-1637) St. Lawrence Ruiz and his companions shed their blood for Christ in Nagasaki, Japan. These martyrs were members of the Order of St. Dominic. They were nine priests, two religious, two sisters, and three laymen. Among the latter was Lawrence Ruiz, a family man from the Philippines. They abundantly sowed the missionary seed of Christianity with the example of their life and death. Historically today is the feast of St. John of Dukla who was born in Dukla, Poland in 1414. He joined the Friars Minor Conventual, a religious order who strictly adhered to their rule of poverty and obedience. Though he went blind later in age he was able to prepare sermons with the help of an aide. His preaching was credited in bringing people back to the Church in his province. Soon after his death, there was an immediate at his tomb and several miracles were attributed to him. On June 10, 1997, he was canonized by Pope John Paul II in a mass at Krosno, Poland before approximately one million people. Patron: Bohemia; brewers; Czech Republic; Moravia. Symbols: Armour; corn; black eagle; coffin held by angels; sword and purse; red banner charged with a white eagle; banner; staff; eagle on shield. Learn more about Prague and the Czech Republic and St. Vitus Cathedral, supposedly started by St. Wenceslas in the 10th century as a small chapel to house relics of St. Vitus and where in the 14th century St. John Nepomucene was buried after being executed for refusing to violate the seal of the confessional. Teach your children the Christmas carol, Good King Wenceslas and discuss his life and virtue. If you can find a copy, a wonderful book with music and illustrations is called Good King Wenceslas: A Legend in Music and Pictures by Mary Reed Newland, published by Seabury Press, 1980. Read about the Infant Jesus of Prague and pray the chaplet. 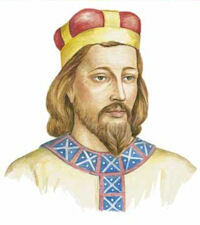 Bake a loaf of bread for dinner and serve wine in honor of St. Wenceslas. Lawrence Ruiz is the first Filipino to be canonized a saint. He and 15 others were martyred at Nagasaki, Japan in 1637. The group included two consecrated women, two other laymen, two brothers and nine priests. Lawrence was born in Manila in the Philippines; his father was Chinese and his mother Filipino. He became associated with the Dominicans, and was a member of the Confraternity of the Holy Rosary. These Dominicans taught him Spanish, and from his parents he learned Chinese and Tagalog. He became a professional calligrapher and transcribed documents. He married and had three children. In 1636, he fled the Philippines after being accused of murder. He joined a missionary group headed for Japan, where Catholics were being persecuted. It was soon found out that the members of this group were Catholic, so they were arrested and taken to Nagasaki. They were tortured for several days, first crushed while hanging upside down for three days, then the bodies were burned, with the ashes thrown into the Pacific Ocean on September 30, 1637. Pope John Paul II canonized these martyrs on October 18, 1987. Symbols: martyr's crown; palm frond. Find out more about the Confraternity of the Holy Rosary. Read more about the Church in Japan. Read more about the history of the Philippines. 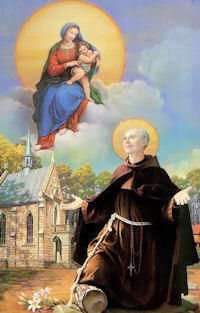 St. John of Dukla was a Franciscan missionary who was born in Dukla, Galicia, Poland, around 1414 and grew up a deeply religious person. He began his religious life as a hermit but then entered the Conventual Franciscans and was ordained. From 1440-1463 he labored as a preacher, and he was elected superior of the monastery because of his holiness and sound judgment. After serving his term in the monastery, John traveled as a missionary to the area of Lvov, in the Ukraine. There a group of Observant Franciscans, called the Bernardines, were conducting their ministries. John was attracted by the Bernardine spirit and transferred to that branch of the order. He was stricken with blindness in the last years of his life, but he did not retire from his pastoral duties. John preached and found his way to the confessional by groping along the pews. He died in Lvov, on September 29, 1484, a beloved priest. He was beatified in 1733 by Pope Clement XII. Pope John Paul II canonized John in Krosno, Poland, on June 10, 1997. St. Simón de Rojas O.SS. Father Simón de Rojas of the Trinitarian Order was born at Valladolid, Castilla, Spain, the 28th of October, 1552. At twelve years of age, he entered the Trinitarian monastery of the city where he was born and there made his religious profession on October 28, 1572; he studied at the University of Salamanca from 1573 to 1579; he was ordained a priest in 1577; he taught philosophy and theology at Toledo from 1581 to 1587; from 1588 until his death he fulfilled with much prudence the office of superior in various monasteries of his province and was sent as apostolic visitor twice to his own province of Castilla, and once to that of Andalusia; on April 14, 1612 he founded the Congregation of the Slaves of the Sweet Name of Mary; in 1619 he was named tutor to the royal princes of Spain; on May 12, 1621 he was elected Provincial of Castilla; on January 1, 1622 he was chosen confessor of Queen Isabel of Borbon; he died on September 29, 1624. It was his mother, the virtuous Constanza, who instilled and helped grow in the soul of Simon the love of Mary. The veneration that she and her husband Gregorio constantly gave to Mary, makes it easily understandable why the first words that Simon, who had been a slow learner and stuttered, said at the age of fourteen months, were "Ave, Maria". He was only repeating the prayer so frequently recited by his parents. His greatest joy was to visit Marian shrines, to pray to Mary and with Mary, to imitate her virtues, to sing her praises, to acknowledge her importance in the mystery of God and of the Church. Through profound theological studies, he came to understand even better the mission of Mary in cooperation with the Trinity for the salvation of the human race and the sanctification of the Church. He lived his religious vows in the imitation of Mary. He held that, for everyone to be completely of God, as Mary had been, it was necessary to become her slaves, or better, slaves of God in Mary; for this reason he established the Congregation of the Slaves of Mary for the greater glory of the Trinity, in praise of the Virgin, in the service of the poor. For him, to be a slave of Mary meant belonging totally to her: "Totus tuus" in order to unite oneself more intimately to Christ and in Him through the Spirit, to the Father. The Congregation founded by him was intended for the laity: persons of every social class could join. The members, who included the King and his children, dedicated themselves to honor Mary by giving maternal help to her favorite children: the poor. This work still continues in Spain. Fr. Simon, who is held to be one of the greatest contemplatives of his time and who in his work, "The Greatness of Prayer" is clearly a great instructor of prayerful souls, wanted the contemplative dimension joined to the active through works of mercy. Faithful to the Trinitarian charism, he promoted the ransom of captives, he helped relieve the many needs of the poor, he consoled the sick, the destitute and the left-out of every kind. He accepted duties at the Court, only on the condition that he be able to continue his work with the poor, whom he helped in a thousand ways, always with a smile on his face and at any hour of the day or night. The expressions of his love of Mary are manifold. The painters who depicted him, put the greeting "Ave Maria" on his lips, words he uttered so frequently that he was familiarly called: "Father Ave Maria". He had thousands of images of the Most Holy Virgin printed with the inscription: "Ave Maria", which he also sent abroad. He had rosaries made with seventy-two blue beads on a white cord, symbols of the Assumption and the Immaculate Conception, and also a reminder that Mary, according to the belief of the time, lived to the age of 72 years. He sent these rosaries everywhere, even to England. Using his influence at Court, he had the angelic greeting so dear to him, "Ave Maria", engraved in letters of gold on the facade of the royal palace in Madrid. On June 5th, 1622, he petitioned the Holy See for the approval of his liturgical text composed in honor of the Sweet Name of Mary, which later, Pope Innocent XI extended to the universal Church. After his death on September 29th, 1624, the honors bestowed on him at his funeral, took on the aspect of an anticipated canonization. For twelve days, the most re-known preachers of Madrid exalted his virtues and his holiness. Impressed with this unanimous veneration, on October 8th, shortly after Fr. Simon's death, the Papal Nuncio ordered the beginning of the process leading to his glorification by the Church. His heroic virtues were recognized by Clement XII, on March 25th, 1735; he was beatified by Clement XIII on March 19, 1766; and on July 3rd, 1988, just before the close of the Marian Year, Pope John Paul 11, entered the name of this great servant of Mary and Father of the poor on the list of the Saints.